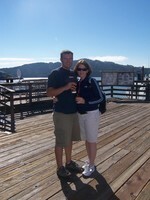 I was married in 02 to wonderful man named Rich, and moved to San Jose in 03. I graduated from SJSU in 05 with my degree in Child and Adolescent Development. I got pregnant right after graduation and moved to Texas when my baby Roxy was two months old. We have lived here for about a year and half and really love it, but I miss my family and friends so much. I just had a little boy named Roscoe in February of this year and really feel like my family is complete. I come out to California as often as possible. Since my husband is now a teacher we plan to spend our Summers in California and avoid the humidity of Houston. Riding down Howe Ave with Stephanie and Sarah and a few others when we saw a guy is car next to use smoking a pipe and, well, the people in the car know what happened next. Having so much fun being on the volleyball team, even though i never played. I had so much fun with all those girls, especially the sleepover at Stephs. Mrs. Skaughs class for student leadership and hating her so much. GOing out to lunch to Taco Bell with Dez, Sarah and Kristy to find HER standing in the parking lot waiting for us. Mrs Lucky who was one of the best teachers ever. Senior trip to hawaii and being approached on the street by the most random people, renting mopeds and a certain someone being arrested for stealing orange juice. Most of all making friends with people who made great impressions on my life. Some I still speak with others not so much. I love that a few of those great friendships stuck. Rachel Jensen Hamm has a birthday today.